Clear Floor Protector Mats by Lloyd are designed for those who want to maintain the color and look of their factory carpet, while protecting it from stains, spills and soil. Lloyds Protector Mats are constructed of a heavy-duty clear vinyl material perfect for the job. Protector Mats are custom fit to the same exact fitting patterns as all other Lloyd’s custom fit products, including many full width coverage patterns for trucks, SUVs and Vans, as well as cargo and trunk patterns. Protector Mats are equipped with factory compatible anchoring devices, or Lloyd’s proprietary anchor system, in addition to a molded vinyl nib backing. The textured face provides additional non-skid safety. Protector mats can easily be wiped clean or with the spray of a hose, dried and reinstalled in minutes. We all try to keep our vehicles clean but driving to and from work, transporting kids or pets, and trying to have an on-the-go snack all take their toll on a vehicle’s carpeting. You need a real world solution to preserve your vehicle’s interior. Lloyd Clear Protector Floor Mats are a solution and so much more! These durable mats are cut to fit any vehicle. The Lloyd factory has over 4,000 precise-fitting patterns, including many one piece door-door patterns. Vinyl ribs on the underside of the mats keep them in place no matter how many times you slide in and out of your vehicle. 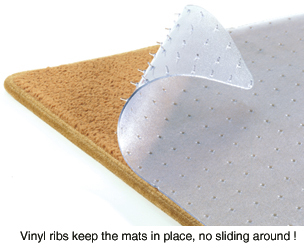 The textured, non-slip surface keeps your feet from sliding even when the mat is wet. Every Lloyd Clear Protector Floor Mat is made of heavy, clear vinyl for long-wearing durability. The vinyl allows the vehicle’s carpeting to show through so there’s no concern about matching the color of the existing carpet. These mats look great in any interior! To clean a Lloyd Protector Mat, just pull it out of the vehicle and hose it off. Small spills can be wiped up immediately. Cargo area mats are also available. Please call for more information on this option. Keep your vehicle’s carpet clean without hiding it! Rather than bulky rubber mats that don’t match your interior at all, line your vehicle with clear vinyl Lloyd Protector Mats. Allows the beauty of the original interior to show through. Tall forward angled vinyl nibs keep Protector Mats in place. Textured face provides safe, non-skid surface. Over 4000 exact fit patterns for every car, truck, SUV and mini van, including cargo and trunk area patterns. Just hose or wipe off to clean. Lloyd Clear Protector Floor Mats are designed to be applied on top of factory carpet. They are not designed to be applied on top of existing floor mats. Doing so can potentially create a safety hazard. Please make a note in the comments section of the order a full description of your vehicle. If you have a truck we need to know if it is two or four door, two or four wheel drive, and if you have bucket or bench seating. If you are ordering for a car please let us know if it is two or four door, coupe or convertible, and AWD or RWD. This will help expedite your order. Please Call for Pricing On: One Piece Overall Mats, Vans, SUV kits, and SUV 3rd Row. Floor mats are custom made. Please allow 5-7 business days for delivery. Custom-made floor mats are a non-returnable item. We guarantee that these products are as advertised and warranty them against manufacturing defects. Floor mats ship from the manufacturer via Ground Service Only. To ensure Christmas delivery, your order must be placed by December 13th.